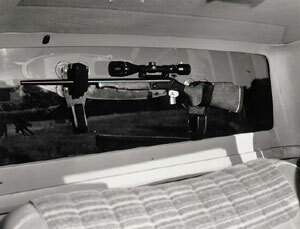 Many states allow a firearm to be carried in a window-mounted gun rack, in the back window of a pickup truck or SUV. This can be a very practical method of storage which keeps the firearm securely out of the drivers and passengers way. For the sake of safety, a trigger lock should be installed when traveling with firearms mounted in this manner. The visible trigger lock sends a positive message about our safety practices and our responsibilities as firearms owners. Security measures in general are very important when traveling in todays society. A firearm stored in plain view, like one mounted in a gun rack, can be an invitation to potential thieves. A trigger lock properly installed acts as a deterrent to theft. The locked gun is far less useful to a criminal when disabled with a trigger lock. As responsible gun owners, we must always be vigilant so our firearms and our ammunition never falls into the wrong hands. The trigger lock can help to eliminate temptation and keep our firearms safe when we travel during the hunt. Today, we have many groups who would work to deny us our rights to hunt and own firearms. Our battle is being waged every day in the media. Our safe and responsible actions as firearms owners can slow the media attacks and work toward the ultimate good of our cause.